Hi everyone, new foundation for you today! 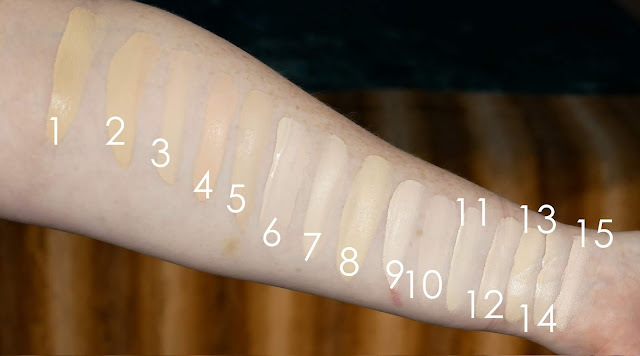 This is from a shade expansion in the new brand Stellar Beauty Limitless Foundation, it's their lightest shade. The formula is light to medium coverage with a natural to radiant finish (for me it depends on how dewy my base is). Like many foundations that don't set down fully, I don't find this one changes color as it dries which is nice. I included wet and dry swatches for reference anyway! I also included in the Dry swatches a wet and dry swatch up above the foundation swatches of MAC Studio Fix Concealer in NC10. It's the concealer I'm wearing in the video under my eyes. For a demo, wear test and more general thoughts check out my video!